Within this buyers guide on the best 37 ton log splitters, you can find relevant reviews to help you make your buying decision all that much easier. I hope to answer this difficult question for you through in depth research and personal experience. If you’re looking for a wood splitter of this caliber, it tells me one of two things. Hardwood Haven – You either have a lot of hardwoods to split which typically need a higher ton rating.Smaller machines simply won’t have the energy to get through hardwood efficiently. Bad experiences with inferior machines. It’s not uncommon to think a 37 ton rated is too high when you first start out splitting logs. But truth be told, it’s really not as powerful as you may think. Compared to a 5 ton log splitter yes, but if you cut a lot of yards or plan too. The odds are a 37 ton machine is probably the best suited machine for you. Perhaps you have started a small firewood business and need to split logs fast and on demand. Don’t mess around with something that is only going to hold you back. 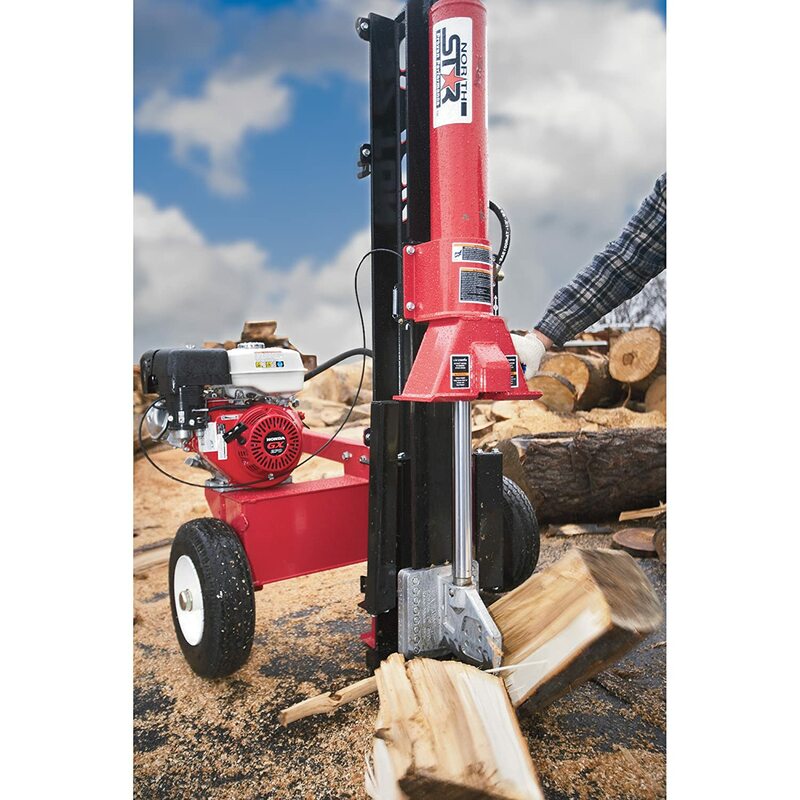 Using a log splitter with a 37 ton rating will be invaluable to your business and satisfied customers. My top rated thirty seven ton rated goes to the brand Northstar. If you have been around this industry long enough, you will be well aware of the Northstar reputation. It’s one of my all time favorite brand for all things outdoors related. In fact, Northstar have three 37 ton log splitters which have differences in engines and features. Read the comparison’s Here. One of the most important things that most people look for, when they are researching is what engine does it have. With the Northstar machine you will be happy to know you are getting a high quality Honda GX270 engine. Which is one tough yet reliable and highly sort after engine. I have found it to be an extremely reliable engine, and one of the best I’ve ever used. It produced plenty of power for the splitting tasks that I had prepared for it, and got through everything I threw at it. The thing that did really surprise me with this engine is that it was actually fairly quiet, well as quiet as something like an engine can be. The next important thing about a splitter is, just how large of a log can it split, and how hard of a wood can it do. When it came to testing I tested a variety of wood, at different sizes and soft and hard woods. When it came to soft woods this splitter just went through everything I put in front of it. It was like a scene out of a horror movie, it split the sweet gum like it was nothing with shards splitting in seconds. These were 30 inches in diameter logs and it was no trouble for this splitter. When it came to testing the hard woods, I used some elm, as most know it has a pretty difficult wood to split. There was no surprise that this machine got through this as well, but I did put smaller logs through it. I still believe that a 24 inch elm log being split this easily is an impressive feat for any log splitter. One important thing that should be on any wood splitter that has a 37 ton rating, that is it needs to be able to have the ability to tow. And thankfully this NorthStar log splitter boasts such a feature. I found it very easy to tow with my truck and my ATV, I just wouldn’t recommend going too fast, don’t push you luck at over 40mph. It’s such a useful feature being able to tow a log splitter, that should be on all powerful log splitters in my opinion. The amount of power this Northstar has is really impressive, how powerful is yet to be determined. I feel it can go larger than the logs I fed it, but I didn’t have the size on hand at the time. One of my favorite features of this machine is that you can swap it from horizontal to vertical, giving you the ability to split even larger logs easily. This is another must if you plan to split large logs. Being able to tow it around town, and over my yard just made life easier over all. Not everybody will require this feature, but it may come in handy down the track. Check out this informative and up close and personal video review of the 37 ton log splitter by Northstar. Pretty impressive. 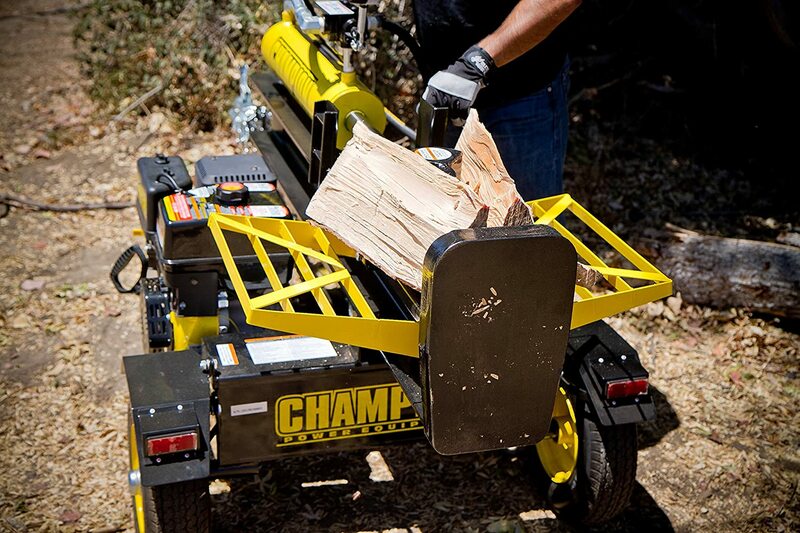 It’s no secret that I like Champions log splitters, for home use and during business hours. Fortunately, this brand also offers one of the best 37 tonnage option available. Myself personally have never had any issue with a Champion splitter, and they have always been extremely reliable. If you are really are wanting a Honda engine I would go the Northstar above, the Champion splitter has there own brand engine. Which might give you cause for concern. But I feel it is an unneeded worry as Champion is such a highly reputable outdoors power equipment brand. This 37 ton log splitting machine has been very reliable starting on the first or second attempt, and it provided plenty of power for splitting. When it came to testing this machines splitting capabilities, I was very impressed with what it could get through. I tested this 37 ton rated with both hard and soft wood. The results ended up being pretty much what I expected form one of the best in the business. With a soft wood like sweet gum, I was able to split logs that were 30 inches in diameter fairly easier. With the hardwoods, I tested it with some more elm and some oak woods. As with the Northstar above the Champion was able to get through logs that were 24 inches in diameter. We put this machine in it’s vertical position and was able to split logs that were 35 inches in diameter, which is very impressive. One thing that I really appreciated about this beast of a splitter, is that it has these log catchers on either side of the work platform. This is one of the most important features in regards to safety in my opinion. As well as improving quality of life, and just makes splitting logs even less physical. They are pretty durable as well, I wasn’t expecting them to handle there recommendation of 100 lb in weight. They could hold heavier then that, but I wouldn’t recommend doing that too often. Especially under warranty. It was nice splitting a log and then not having to bend over and pick it up off the ground to split again. This also restricts the amount of potential foot damage as well with less chances of the logs flying off into your foot. The splitting ability of this machine is incredible, and split everything very easily and for me it didn’t struggle at all. One of the toughest 37 ton log splitters on the market. Without a doubt my favorite feature of any log splitter is it’s ability to change between horizontal and vertical, and think this should be on all splitters. The side guard rails are just too good to not have. While there are a few other options in regards to this amount of exact tonnage rating, I find that these two are the best 37 ton log splitters money can buy. Both offer vertical splitting options, while taking safety and portability into account. Both are reputable brands in the woodcutting industry and have years of experience behind them. So I have no hesitation at all in recommending them to commercial users and also for domestic use. Feel free to drop a comment if you need to know anything further about these two heavy duty machines. To be on this list, I had a few requirements. First and foremost the companies had to be known for producing quality equipment and also have excellent customer service. There have been a few times that I’ve had an issue with my splitter, and the company has gone out of there way to get out of it’s duty to fix my machine. This speaks volumes and will be the best indicator for whats ahead. 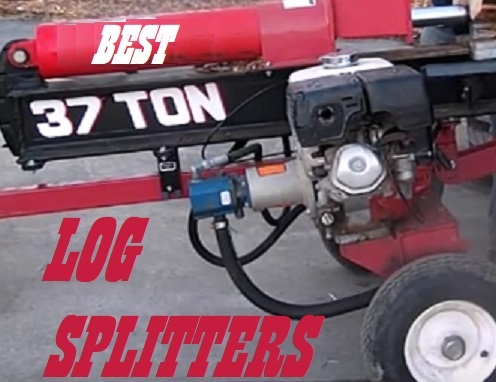 The log splitters themselves have to be extremely well made, and be very durable and reliable. There is nothing worse then spending a decent size of money on a piece of equipment and having it break down after a few uses. Of course at times you can get a lemon. Which is why customer service is ranked so highly by me.